The BMA (UK) is a Marxist-Leninist educational and political grouping premised in-part, upon the ongoing work of the Oxford Collective - a group of ever-changing leftwing-leaning Oxford academics over the years (linked primarily to the Communist Party of Britain), that views certain philosophical and practical elements of Buddhist praxis to be fully inaccordance with Marxist Revolutionary Thought. Vegetarianism is a method of directly attacking and depriving the capitalist (and hideously 'mechanised') meat industry of its ‘profit’ at source, and depriving that industry of operating finance. Vegetarianism is strictly followed amongst Chinese Buddhists, and is evident within the Buddhist monastic and lay communities throughout Asia. Being a vegetarian is a matter of personal choice and individual evolution, and the BMA (UK) certainly does not advocate any negative attitudes toward non-vegetarians - many of whom perform vital and important Animal Rights activism. Vegetarianism is the simple choice not to consume meat whilst living in an advanced capitalist society, where ample (and nutritious) non-meat products are often available. Of course, due to the grinding poverty in other parts of the world, (which may include impoverished Working Class areas in the West), the financial ability to purchase non-meat products is not always available, with the poorest people in society 'trapped' in a cycle of industrialised 'meat dependency'. An individual must first understand the chain of events within which they participate through personal habit, and how this drives the machinery of 24 hour slaughter factories, and condemns millions upon millions of animals to a sad, painful and tragic death every single day. Once this is understood, an individual can choose to 'free' him or herself from this cycle of dependency and cruelty, and decide never again to eat meat. This is a Radical and Non-Violent militant position, that directly attacks the meat industry, but which is 'accepted' by the Bourgeois State as a legitimate 'life choice'. The industrialised meat industry is a major facet of the capitalist system, and anyone and everyone can participate in its undermining through a peaceful and powerful demonstration of Proletariat Solidarity and Free Will! 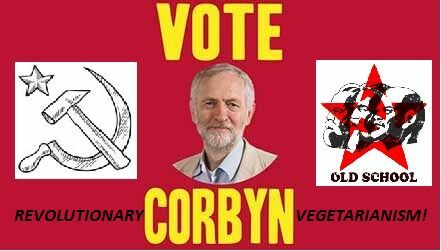 In this regard, the BMA (UK) is proud to fully support and endorse a British Labour Party led by Jeremy Corbyn MP - who will shortly become the UK's 'first' vegetarian Prime Minister!